Astrophotographer Jim "Woody" Woods sent in this photo of the moon and Jupiter he took at about 1 am, Saturday, Sept. 8, 2012 from his backyard in Long Beach, CA. The moon will take center stage for stargazers in the around the world tonight (Sept. 22) during International Observe the Moon Night to share the beauty of Earth's nearest neighbor with the public. Many moon-watching events are planned around the world tonight, with NASA and Canadian astronomers aren't missing out. NASA's Ames Research Center in Moffett Field, Calif., and Western University in Ontario, Canada, will hold special events to share methods on how to observe the moon with the public, as well as interesting moon facts and history. Tonight, the moon will appear half-full in what is known as the first quarter moon, making it a prime target for amateur astronomers and casual night sky observers. "The first quarter moon rises around 2:25 p.m. and sets around 12:15 a.m." explained SPACE.com contributor Geoff Gaherty, an astronomer with Starry Night Software, which offers computer guides to the night sky. "It dominates the evening sky." The full moon of September, which is also known as a Harvest Moon, will rise on Sept. 29. 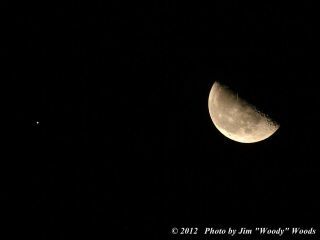 On Saturday, Sept. 22, the first quarter moon rises around 2:25 p.m. and sets around 12:15 a.m. It dominates the evening sky. At the Ames Research Center, astronomers with NASA's Lunar Science Institute will hold five 15-minute discussions and presentations on the moon at Shenandoah Plaza, while visiting amateur astronomers and astronomy clubs will set up telescopes for public viewing. The event runs from 8 p.m. to 11 p.m. PDT. "In addition to observing the Moon with Western's Perkin-Elmer refracting telescope (weather permitting), astronomers and planetary scientists will deliver talks, present lunar meteorites and lead a cell phone photo contest," Western University officials said in a statement. The NASA Ames and Western University events are just two of countless public moon-watching programs scheduled around the world for the International Observe the Moon Night, which is now in its third year. This year's event comes just weeks after the death of Neil Armstrong, the first person ever to walk on the moon. Armstrong, who commanded NASA's Apollo 11 moon landing mission, died on Aug. 25 at age 82 due to complications from recent heart surgery. He was buried at sea on Sept. 14. To honor Armstrong's memory, his family has asked that the public take time to think of the pioneering astronaut when gazing at the moon.
" Honor his example of service, accomplishment and modesty, and the next time you walk outside on a clear night and see the moon smiling down at you, think of Neil Armstrong and give him a wink," they said in a statement. Editor's note: If you take an amazing photo of the moon that you'd like to share for a possible story or image gallery, please contact managing editor Tariq Malik at tmalik@space.com.